But sometimes, a dish that was maybe conceived as a lighter variation of a classic turns out so good that I wind up craving it. For example: this turkey loaf is absolutely delicious, and compared to its original parent, quite a bit healthier. The recipe comes from “American Favorites“. Melt the butter in a skillet over medium heat and add the carrots, onions, and celery, season with a pinch of salt, and sautee’ until soft. Remove from heat and allow it to cool. Place ground turkey in a large bowl and mix in all the other ingredients, adding the egg whites last. The mixture will be quite “wet”. Shape it in two oval loaves as shown in the photo, pace them in a roasting pan (I like to use parchment paper or Silpat underneath). Place in a 350F oven and cook for 45 minutes to 1 hour. Remove and allow it to cool for 5 minutes before cutting into slices. 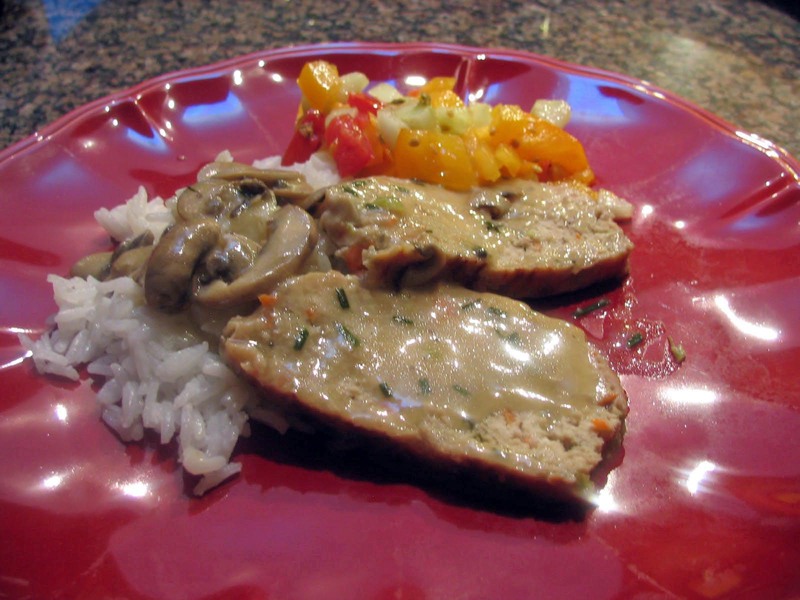 Serve with or without mushroom gravy. Heat the butter in a heavy skillet, add in the chives and cook, stirring, for about 2 minutes. Add the mushrooms and cook them until tender, 4 to 5 minutes. Season with salt to taste and transfer to a bowl. Melt the remaining 1 tablespoon of butter in the same pan and add the flour and cook, stirring, for 2 minutes. Add broth and whisk until sauce is smooth and thickens slightly, 2 to 3 minutes. Whisk in the soy sauce, and put the reserved mushroom mixture back in the pan. 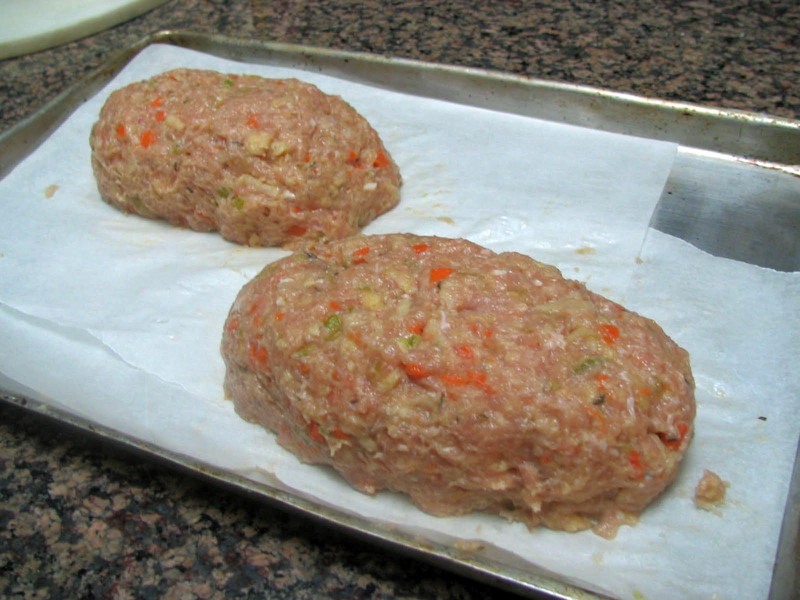 To serve meat loaves, cut into 1/2-inch-thick slices and arrange on a serving platter. Ladle some mushroom gravy over the slices. This is a good opportunity to show you my Zyliss (an older version of this one), a little gadget I’ve had for a long time, but neglected to put to use until I saw Michael Chiarello on FoodTV using his. He removed the plastic base that came with the cutter, instead placing it directly on the cutting board. Why didn’t I think of that? I tried his method and loved it! The plastic base is a pain to use and wash; by placing the cutter on a cutting board you get its full benefits without any hassles. 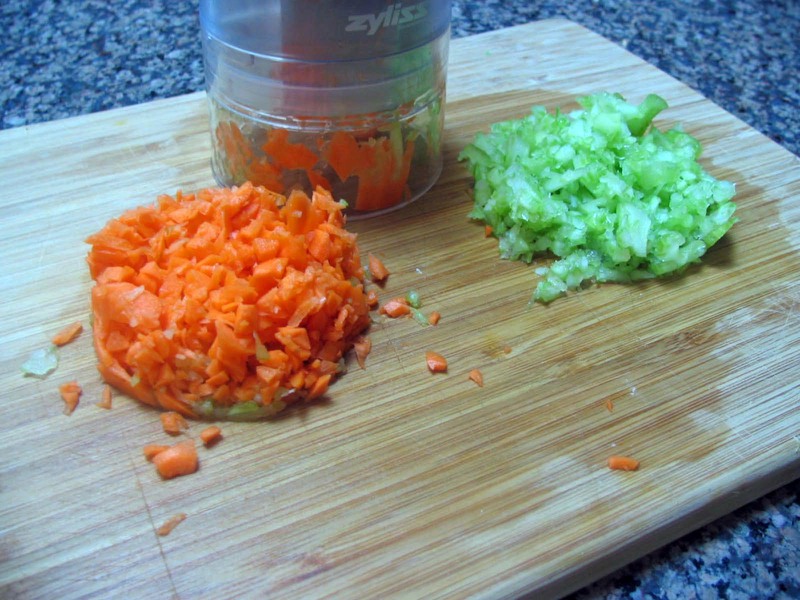 Carrots, onions, celery, garlic and peppers are prepared in seconds! Check it out in this photo (click to enlarge). The mushroom gravy: Even though its taste was excellent, if you prefer a more contrasting color in the gravy then add a little tomato paste or sautee some tomatoes with the mushrooms. A little rice, a little tomato salad, and…. dinner is served! Derreta a manteiga, adicione a cenoura, cebola e salsao, tempere com um pouquinho de sal, cozinhe ate’ que fique macio, cerca de 5 minutos. Transfira para uma vasilha e deixe esfriar por completo. Coloque a carne moida em uma tigela grande, e misture todos os outros ingredientes, deixando as claras de ovos por ultimo. A mistura tera’ uma consistencia um pouco liquida. Forme em dois bolos ovais como mostrado na foto, e coloque em uma assadeira protegida por papel manteiga. Asse em forno medio por 45 minutos a 1 hora. Retire do forno e deixe esfriar por 5 minutos antes de cortar em fatias. Sirva com o molho de cogumelos. Aqueca 1 colher de sopa de manteiga em uma frigideira tefal e adicione as cebolinhas, cozinhe por 2 minutos. Adicione os cogumelos e cozinhe ate’ que fiquem macios, 4 a 5 minutos. Tempere com sal, transfira para uma tigela. Derreta o resto da manteiga na mesma panela, adicione a farinha de trigo e cozinhe, misturando sempre, por cerca de dois minutos. Adicione o caldo de galinha e misture bem ate’ que engrosse um pouco. Adicione o molho de soja e os cogumelos reservados. Para servir, corte o bolo de frango em fatias, e espalhe o molho por cima e ao lado das fatias.